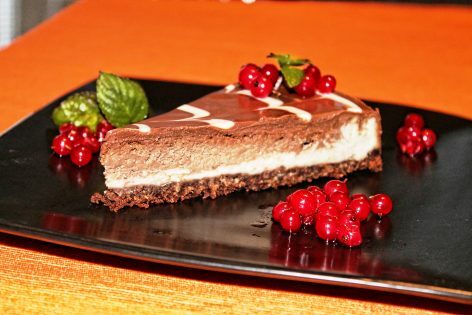 When Someone Brings Up Your Weight: A Cheesecake Dilemma - Compared to Who? Have you ever had someone bring up YOUR weight or the topic of weight loss during dinner? Do you stop eating? Hide your body under the table cloth? Defend yourself with your food journal? Here’s a dilemma many of us can all relate to and how contributor Summer handled it. It’s Christmas Day. I worked hard, all day, preparing a meal for my family. We were up early getting that turkey in the oven, preparing the sides, and spending the extra time needed to prepare a very special meal. This Christmas was different. It was the first where I had allowed myself to be free of my struggle with dieting. I decided to give myself the freedom to enjoy the season for what it was–a time for celebrating the birth of Jesus with family and friends. I allowed myself to have special treats and meals – guilt and shame free! It was a freeing experience for me. Finally, food was not the center of my life. Jesus was my focus. Ugh! I immediately felt a knot form in my throat. Can I have a side order of guilt and shame with my cheesecake? I thought for sure that response would squelch the subject. And yet . . .the dieting tips continued! I began to feel more and more guilt and embarrassment. How could I dare eat a piece of cheesecake at my current weight? My feelings were all over the place. Come on? It’s Christmas Day! I worked hard to prepare a meal for my family. I had been looking forward to a piece of that cheesecake since I made it. Was it wrong to have a piece? I felt offended, hurt, and angry that someone would make these comments, especially on such a special day! Fortunately, God’s worked in my heart and shown me the importance of forgiveness and compassion for others. This empathy is the only thing that kept me from letting my emotions rule. This time, however, God showed me another way to handle this hurt. He led me to pray for her and find compassion. This may not be the last time that someone brings up my weight during dinner. Life always presents us with these types of “challenges.” But, I’m learning it’s our reaction to the challenge–be it an unkind comment, a cruel remark, or blatant fat shaming–that allows us to live a life of freedom and happiness. We can hold on to anger and hurt, or we can choose to forgive. It may not happen overnight, but Jesus will heal us when we take our hurt him. He teaches that forgiveness will set us free. (Ephesians 4:31-32) We begin to see our offenders through God’s eyes–as human and imperfect–just like we are. Praying for the person who has offended us helps to bring us His peace. And, just maybe, once we’ve found his peace, we can enjoy a piece of cheesecake guilt free. Good for you, Summer. Yes, cheesecake in the face would have been a waste of good cheesecake. Vengeance is mine, says the Lord. Well, I hope the Lord threw some cheapo cheesecake in her face at some point. Is that bad? Thanks , Wendy 😉 No cheesecake for her, she’s not a big sweet eater. But I sure did enjoy my piece.. and my current peace!